Roger Ebert may be America's most famous movie critic because of his television show with the late Gene Siskel. But famous or not, Ebert is determined to make film experts out of us all. This wonderful book collects literally a century of writing about film. 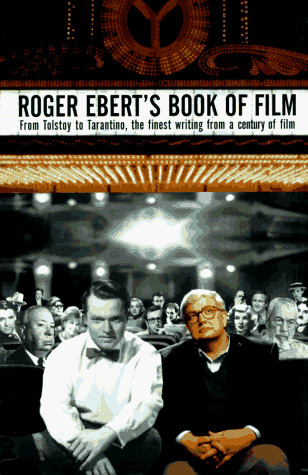 For this book, Ebert found an extraordinary essay written by Leo Tolstoy at the end of his life, and at the beginning of the movies. E.M. Forster wrote an essay about Mickey Mouse. Excerpts from great biographies by Chaplin, Bunuel, Louise Brooks, Kurosawa, and Herzog are included, as well as excerpts from novels like The Moviegoer, The Godfather, The Player, and Get Shorty. I could almost write a book myself describing all the great stuff in here. Best of all is Ebert's own classic interview with Lee Marvin, in the days before the "hotel room" interview. If I've forgotten any great film books on this page, you can probably find them excerpted in Roger Ebert's Book of Film.